Until May 10, Juicy Stakes is adding a 5% bonus to all Blackjack wins. Known primarily for its busy poker room, Juicy Stakes also has a suite of casino games from Cake Gaming which also welcomes players from all over the world. To receive up to $200 in bonus cash, all players have to do is place a winning bet playing any of the casino’s 4 Blackjack games: Blackjack, Face Up 21, Double Draw, Perfect Pair. The casino will automatically add 5% to all wins. The additional 5% winnings will be a bonus balance which can be withdrawn once the 10X play-through requirement has been met. 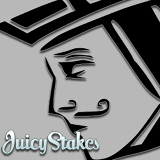 Blackjack bonus added to all winning bets at Juicy Stakes until May 10, 2016 only. Juicy Stakes, one of the most popular online poker rooms on the Horizon Poker Network, is famous for its online satellite tournaments that send winners to play in live tournaments in Europe and the Caribbean. The next series will award trips to the prestigious CAPT Velden tournament in Austria this summer. Online satellite tournaments that will send winners to the €700,00 European Poker Championships at CAPT Velden this summer continue until this Sunday. . The winner will travel to Austria’s ‘Monte Carlo of the Alps’ to play in the prestigious €700,000 CAPT Velden European Poker Championship this summer. Their €4,500 ($5,000) prize package includes $500 in travel expenses, 5 nights accommodation plus €2500 + €200 buy-in to the Main Event at CAPT Velden. A group of previous online satellite tournament winners has just returned from the Caribbean where they played in the TKPT St Maarten poker tournament. Videos of their poker adventure are available on the Living the Dream poker blog (http://www.live-dream-poker.com).